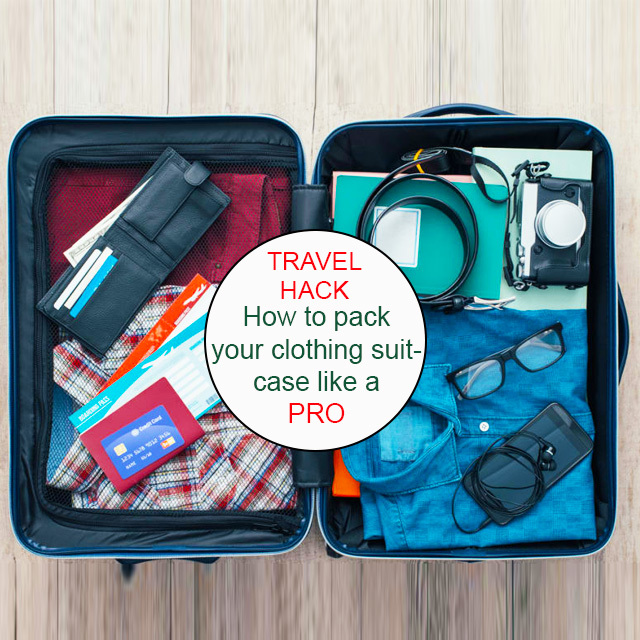 In this article we are going to look at how to pack your suitcase more efficiently in 5 simple steps. We would like to start by giving a shout out and say a special thank you to Real Simple for this great packing guide. Step 1: Gather all the garments you anticipate needing. Then put half of them back. Select clothes in the same color family, packing more tops than bottoms. For a five-day trip, you’ll likely need five shirts, two pairs of slacks or jeans, and one skirt. Your average 55cm check-in bag fits roughly two pairs of jeans, three sweaters, two dresses, and five shirts. Step 2: Choose knits, wools, and cottons. These fabrics tend to resist wrinkles and are versatile (some garments can do double duty, like yoga pants that moonlight as pajamas). Step 3: Roll softer garments and fold stiffer ones. Underwear, T-shirts, jeans, cotton pants, and knitwear won’t wrinkle when rolled tightly. Stiffer fabrics, such as starched cotton shirts, blazers, dressy pants, and skirts, should be carefully folded. Step 4: Arrange rolled items in the bottom of the bag. Think of your suitcase as a three-layer cake. The suitcase is the icing; the rolled items make up the first layer. Step 5: Place folded garments next. For your (cream filling) middle layer, start with the longest items, like skirts and slacks. Stack the garments on top of each other, alternating waists with hems. Position the pile flush with the suitcase, draping leftover fabric over the opposite end. (This conserves space since thick waistbands won’t be piled on top of one another.) Wrap the draping ends of the pile into the center. Next, lay collars of shorter items, like shirts, at the hinge with the ends over the handles. Fold the collars and ends over once and fold the arms in. Step 6: Cover the pile with a dry-cleaning bag. It’s like Botox for your clothes. Because of the bag’s slippery surface, folded clothes don’t stay in one place long enough for creases to set. Easy upgrade: Place a bag between each layer of clothing. To get to a certain layer easily, simply pull the ends of the bag up on either side. Step 7: Top the pile with the clothes you’ll need first. Anything goes with your top layer―a bathing suit or pajamas. Step 8: Snake belts around the perimeter of the bag. This cradles your three layers.